We kept getting recommendations from people, and the persuasion of one reader that knew we needed to go, is what finally made us get in line. By that I seriously mean, get in line. The place opens at 9am. We rolled up just before 9am and the line was out the door. A guy comes through asking how many people in your party. We say 2 and he takes off. As the doors open you are directed to your seat. We grabbed the very last table, everyone else waited. Luckily we were towards the back, so I didn’t feel bad watching them drool. As soon as our server shows up I begin with all my questions. I have no idea what to order. Many things look intriguing, but you know when you are at a Swedish restaurant you want to make sure you order something authentic and special, and that’s what we were asking about. We decided on one of the backed egg dishes and a hash. 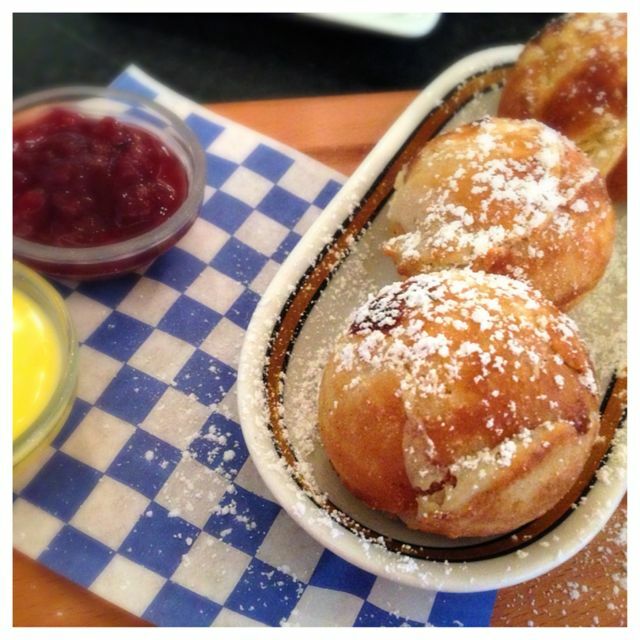 While we were waiting someone brought out Traditional Aebleskiver, which is a Danish pancake, with lemon curd & lingonberry jam. I was super confused when he set it down, because we obviously had not ordered it. He sees the the look on my face and says our server sent them out because we had never been before and he knows these are something we needed to try. NO WAY!! With a big smile we dig right in. I love, love, love lemon curd, so yes, I was slathering on the lemon curd. We loved this little breakfast appetizer. We also noticed that many people were ordering these, so don’t miss out on these for sure. 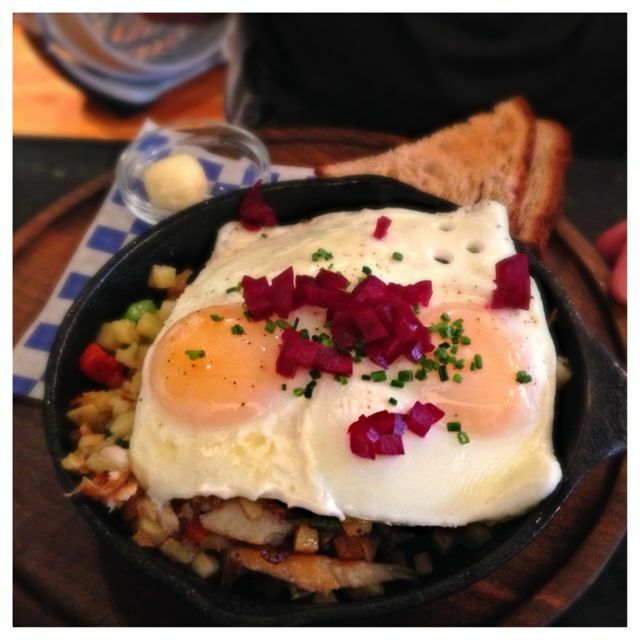 My husband got the Smoked Trout Hash, which our server said was a very popular dish, and it was fantastic. I took more than one bite. Lucky for me he’s not a beet fan, so I got all those bites. When he wasn’t looking I would toss them around the dish to secure more bites. Yes, sometimes I do play dirty. 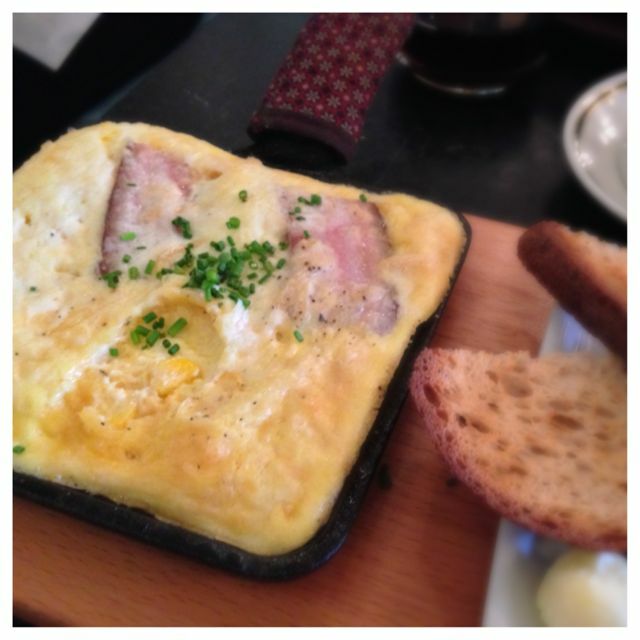 I got the baked eggs with pork belly. I loved the sweet corn running through this dish. It was also a great dish that I enjoyed. I got the potato pancake as my side and loved it too. I am super glad we did not have to wait, but I think it would be worth the wait. We loved it and plan to return someday. We might come later in the day and try their lunch menu and we have also read that it’s not such a wait. Here are a few things you should know. They will put you on a wait list, but they won’t give you a time limit. They simply don’t know how long it’s going to take people to order and enjoy their meal, plus people come and go off the wait list. They do have a place for you to wait so you can have coffee as you wait. Atmosphere was really quaint and cozy. It’s a small space and they pack in the tables. Even though we were right on top of other tables we never felt like were invading each others space. Service was above and beyond. Our guy was very helpful and the other staff kept the coffee full. Pricing was really good. Good sized portions for you money. Coffee was good, but not sure what it was. The tea was loose leaf and fabulous. The tea cup came out hot so my tea was never cold. Love that. Broder is located on Clinton and 25th. Broder is one of my favorite breakfast restaurants, second to Gravy on Mississippi Ave. The Mumford and Sons band enjoyed breakfast at Broder when they were here a few years ago. They mentioned it during the concert. I thought it was really cool they would go to a tiny, local restaurant like that and then tell everyone about it. Of course their mentioning how awesome Broder is probably didn’t help with the wait list! I’ve wanted to go here since it opened but the Portland culture of standing in line for over an hour just to get a seat makes me mental. Who has time for that?!?!? Even during the week! A few things. Go during the week. The lines aren’t that bad. Lunch is fantastic. My favorite is the Stockholm hot dog with skagen shrimp, and the Swedish meatball sandwich. So glad you loved it. Broder is one of my favorites in PDX. I now remember you telling me about this PFA you did with Paul Gerald. That would have been a great one for sure.